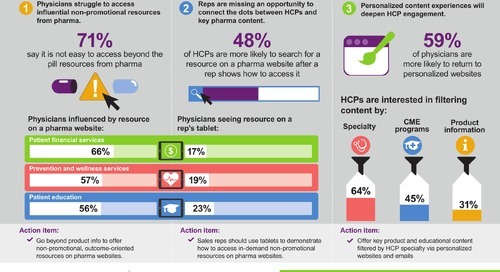 Serving up stale rep content correlates with greater distrust in info from pharma. 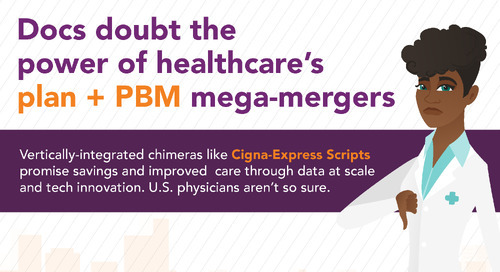 Physicians tell us pharma reps present them with info they already knew in nearly two-thirds of details (64%), on average. 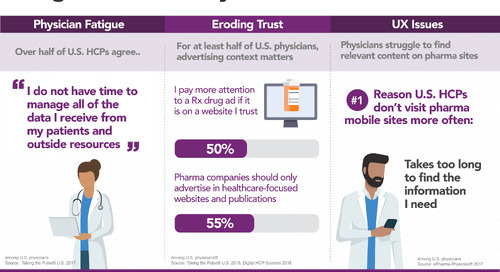 Those least trusting of pharma info provided by their rep report seeing stale content even more frequently, in more than three-quarters of details (76%*), suggesting that quality and relevance of content impacts trust. 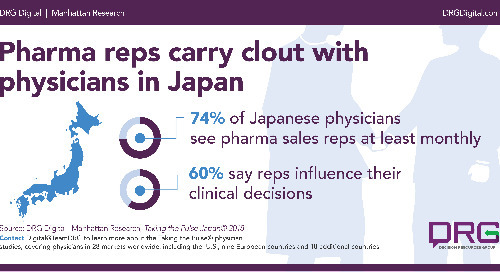 Pharmas can address this problem by training sales forces to pivot from redundant product info and arming reps with content that makes them partners in care rather than just walking sample cabinets hawking a product. 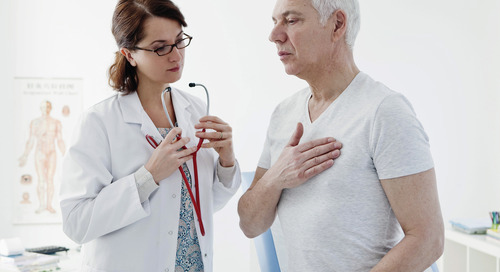 Patient support and financial assistance resources are highly influential, with over three-quarters of physicians expressing adherence services, support program enrollment, reimbursement info and financial support information is influential to their prescription decisions. 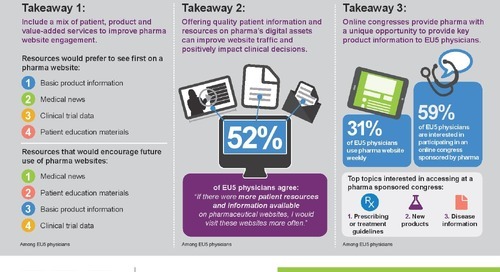 Offering a varied menu of website content rich in patient-centered and value-added resources may boost trust and engagement. 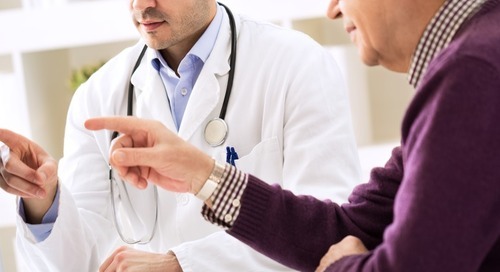 Fewer than 1 in 10 physicians visits pharma sites daily, and that may be because they’re not able to access the resources of greatest interest to them, whether because of UX issues or poor content prioritization. 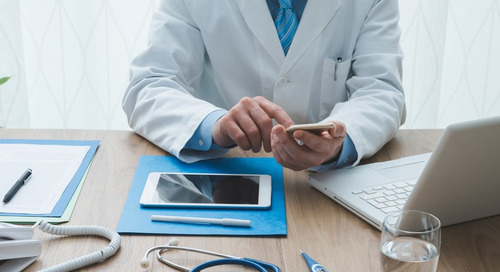 Use tilts toward product resources, but there’s strong unmet interest among physicians for patient resources like digital tools patients can use to track treatments, info about consumer devices to support treatment, and printable tools to track treatments.  We found that the nearly two-fifths of physicians* who trust info on pharma sites are much more likely to perceive a broad range of offerings and to access more value-added resources on these sites. 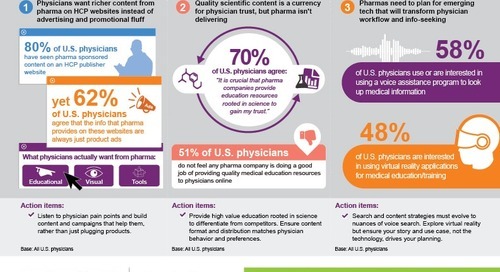 Pharmas can answer unmet need and potentially boost trust by ensuring that value-added resources are featured and findable on their websites. 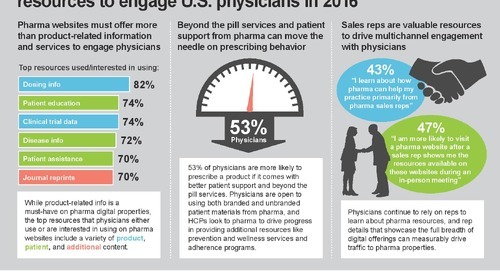 Pharmas may be missing opportunities to engage busy physicians beyond face-to-face meetings. 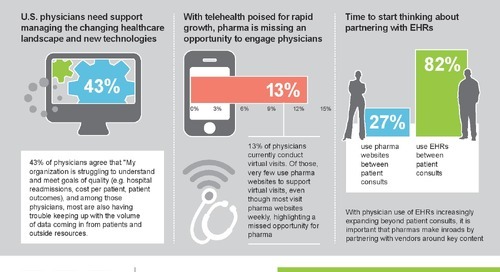 Remote communication between reps and physicians is on the rise, driven mostly by email. 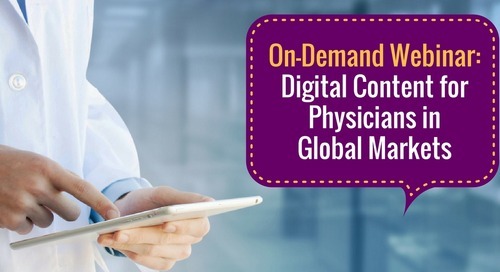 But while use of remote detailing remains modest, half of physicians (49%) express interest in using remote details – up from 35% last year. 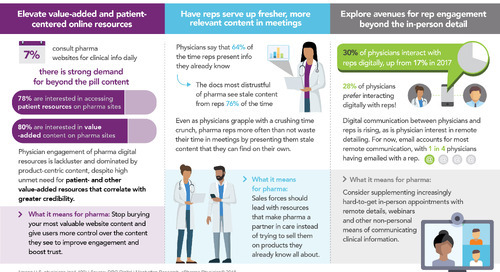 With in-person rep appointments ever harder to come by, pharmas should explore remote and non-personal modes of communication with physicians, both as a means of extending the rep relationship between visits and to reach docs that just don’t have time for in-person details anymore. 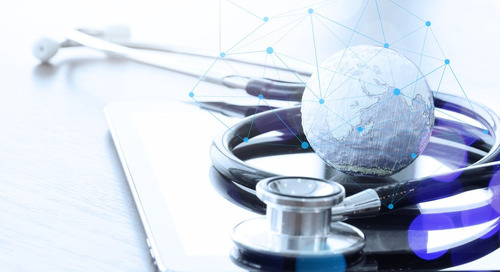 Want to know more about how your brands might benefit from our physician research, spanning 25 markets around the world and up to a dozen specialties, depending on sample size? 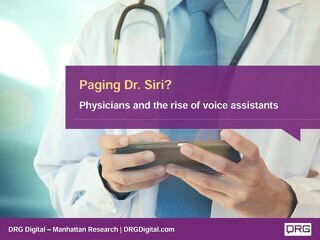 Contact us at Digital@TeamDRG.com.